The Great Record Store Extinction is claiming another victim. Metal Haven, one of my all-time favorite record stores (the blurb from our Lincoln Square/North Center neighborhood guide is here), has announced on its MySpace blog that it's closing its doors imminently. The upside is that the store is throwing an "Armageddon Sale," which will offer progressively steeper discounts on everything in stock (with the exception of items bearing a red tag) until Metal Haven's final day of business. The sale started last week with a 15 percent discount, and the rate will soon jump to 20 percent if it hasn't already. The downside, and it's a huge one, is that Chicago and the world are losing one of those rare record stores geared to the hard-core superfans of a particular musical style, a temple of obsessive genre devotion for a customer base among whom the possession of arcane knowledge and the expenditure of untold hours crate digging is the rule rather than the exception. Metal Haven is closed Mondays, but I'll have more info tomorrow. 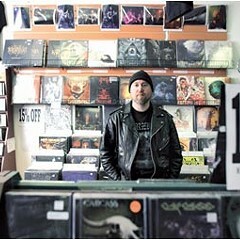 The Ravenswood record store--a destination for serious metal fans in and out of town--is winding down.